Saying that Chinese increasingly assertive nationalism has a rather ethnocentric streak is nothing new, at least not for those who follow China. However, only when you actually read the source material in Chinese, is the starkness of the PRC’s racialism really driven home. This is something analysts, and other people paid to have opinions on China, should do more often, especially when the English translation often softens the edges a bit. To demonstrate this, I will quote a paragraph from Mark Zuckerberg’s favourite Xi Jinping book—The Governance of China. 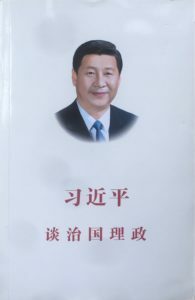 This collection of formulaic speeches—complete with hagiographic pictures of Chairman Xi doing important things—contains a speech he gave on 6 June 2014 to the Seventh Conference of the Friendship of Overseas Chinese Associations (世界华侨华人社团联谊) entitled ‘The Rejuvenation of the Chinese Nation Is a Dream Shared by All Chinese’. The title already confronts us with translation issues: In the Mandarin name of the association, ‘Overseas Chinese’ is written as ‘华侨华人’, which introduces is to the difficulty of the English word ‘Chinese’. English lacks the distinctions you do find in Chinese: 中国人 (zhōngguó rén), meaning someone from the country China; 华侨 (huá qiáo), a politically laden term deserving of its own blog post meaning ‘overseas Chinese’, implying sojourner status; and 华人 (huá rén), meaning ‘Chinese (ethnic) person’, or 华裔 (huá yì), meaning ‘of Chinese ethnicity’. This ‘华’ (huá) is a shortened version of ‘中华’ (zhōnghuá), which can be found in the official name of the People’s Republic of China—中华人民共和国 (zhōnghuá rénmín gònghéguó)—as well as that of the Republic of China—中华民国 (zhōnghuá mínguó). To use a Germanic word, 中华 refers to the Volk. 中国人 refers to the citizens. I will use ‘Chinese (ethnic)’ and ‘Chinese (citizen)’. This is a distinction not all people from the PRC understand. My Chinese textbook at Peking University contained a text referring to Singaporeans as ‘那些中国人’, or ‘those Chinese (citizen)’. When I tried to explain why that was wrong to a Chinese friend, he did not understand: Singaporeans are Chinese [sic], no? And what to make of the Chinese ambassador to Malaysia, who declared the safety of ethnic Chinese in his host country to concern the PRC’s national interest, and—according to an RSIS newsletter—recently accompanied an MP of coalition party Malaysian Chinese Association (MCA) on house visits? Before we continue, we need to introduce another problematic Chinese term: 民族 (mínzú), which means both nation and ethnic group. So, to say that China is a multi-ethnic nation you would confusingly have to say that it is a 多民族民族, which is why you instead find the formulation 多民族国家, ‘multi-ethnic state’. 中华民族 (zhōnghuá mínzú) is thus the Chinese Volk or nation, but within China, 民族 (mínzú) refers to its myriad ethnic minorities. Taking this into account, we can see that the Chinese title of the speech in question is rather different from the English translation: ‘实现中华民族伟大复兴的海内外中华儿女共同的梦’. Literally translated, this says ‘Achieving the Great Rejuvenation of the Chinese Volk is the common dream of the sons and daughters of the Chinese (ethnic)’. Even in domestic speeches, the much-vaunted Chinese Dream is properly defined as the ‘China (country) Dream of the Great Rejuvenation of the Chinese Volk’ (中华民族伟大复兴的中国梦 zhōnghuá mínzú wěidà fùxīng de zhōngguó mèng). The paragraph from the speech is stated as a description of how Chinese (ethnic) are, but actually is a prescription of how they should behave. The tens of millions of overseas Chinese [compatriots] across the world are all members of the Chinese [(ethnic)] family. In [Carrying on] the best of Chinese [Volk] traditions, generations of overseas Chinese [compatriots] never forget their home country [motherland], their origins*, or the blood of the Chinese nation [(Volk)] flowing in their veins. They have given their enthusiastic support to China’s [(PRC)] revolution, construction and reform. They have made a major contribution to the growth of the Chinese nation [(Volk)], to the peaceful reunification of the motherland [i.e. Taiwan issue], and to the friendly people-to-people cooperation between [the people of the country] China and [the people of] other countries. [The motherland will always remember the vast] Their contribution [of the overseas compatriots] will always be remembered. *‘Origins’ is the rather innocuous-seeming translation used for 祖籍 (zǔjí), which the dictionary defines as ‘ancestral hometown’, ‘original family home’ or ‘original domicile’. The ‘祖’ comes from 祖国 (zǔguó), meaning home country/motherland. The ‘籍’ is also used in 国籍 (guójí), meaning ‘nationality’. Serve as a positive link between the motherland and the countries where they live. The term ‘proper’ matters: Chinese should carry on ‘the best’ of their tradition, and that tradition is to serve the motherland, and by extension the Party. This ethno-nationalist discourse should be seen in the light of China’s current historical narrative: the Century of National Humiliation (百年国耻 bǎinián guóchǐ). In schools and in movies, the Chinese learn that for a century Western and Japanese imperialists bullied China and drove it from its rightful central position in the world. This coincided with two humiliating losses: loss of territory, and loss of people. The former is easily visible for outside observers, since it is directed at other countries: already during the 1910s and 1920s, Chinese published ‘national humiliation maps’ that showed the territory lost to foreign powers. These included suzerainty over Korea and Southeast Asia as well as places such as Outer Mongolia, Taiwan and Hong Kong. Nowadays, this part of the narrative has been scaled back to fuel contentious claims to Taiwan and the South China Sea islands. Hong Kong was ‘returned’ to the motherland in 1997. However, the current issues there highlight the second loss, a discourse that is more limited to the Chinese-language sources. That loss is the loss of the people: not only was China so weak militarily that it could not hold on to all its territory, it was also so weak economically and culturally that it would humiliatingly lose many of its people. These are the people who moved to Southeast Asia or the West, but also people formally under Chinese sovereignty that have ‘desinicised’. Hong Kong, for example, has been retrieved, but the ‘westernisation’ of its people—i.e. their refusal to ‘carry on the best of Chinese traditions’—is a humiliation that has not yet been cleansed. Similarly, when Singapore’s Lee Kuan Yew died, nationalist online commentators called him a 汉奸 (hànjiān), or race traitor, because he let his people ‘westernise’. Academics I talked to, too, complained in less aggressive terms that Singaporeans are losing their ‘Chineseness’, conveniently ignoring Singapore’s multiracialism. Much as with China’s minorities, for these commentators the minorities in Singapore are merely background characters. Speeches such as the one discussed in this post should cause more alarm. Several countries are responsible for sizeable groups of citizens of ethnic Chinese descent. China lays claim to them and expects a certain behaviour. With its newfound wealth and increased confidence China affects these communities with its ethnic nationalism through education and media. Singapore’s struggle with Beijing’s racial expectations garnered headlines in 2016. But in most countries, the Chinese communities are not that big and they attract less attention, while Beijing continues to expand its claims to them.